I show y'all the foyer quite often and the vignettes I create for it, but we don't use the front door for everyday life we use the door to the garage. I thought I would share the vignette that we see on a daily basis. This vignette has been this way since Christmas. I know, can you believe it? I hung this ugly bird picture here, yes I call it ugly, along with a weathered lamp, vintage clock, and a tray of collected bottles in the color of the sea. The color of these vintage bottles remind me of sea glass. I gathered them together on my old silver tray. I pick these bottles up at flea markets when I find them at a good price. I think the most I have paid is $15 and that was for the large one. This lamp that I painted a few years ago used to reside in one of the guest rooms. I have a stack of lampshades that I can use to easily change the look of my lamps. I like how this black one works with the black frame and the black handles on the chest. So even though this vignette has been here for months it works well for summer. 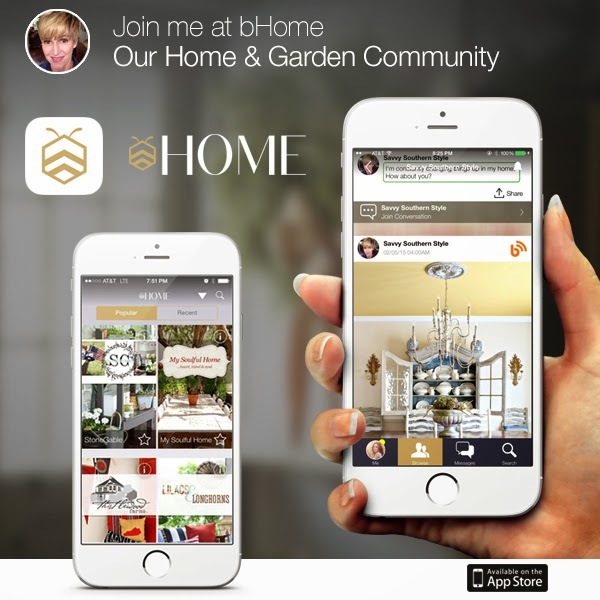 The bHome app is now available for android phones!! 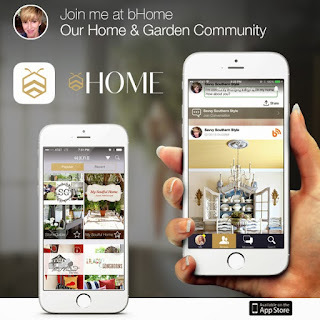 If you need more info about this app you can read my original post here. I love the old bottles on the silver tray. We use both entries... but alas the garage one is sad!! I went in to work on it yesterday, was overwhelmed and left . Hahahaha. Now I will revisit! I love the glass bottles. Bird picture is, um, interesting. :-) Our garage entry opens into the laundry room in the city house and kitchen at the farm house. The laundry room is hopeless...too small to do anything extra to. I like the kitchen at the farm though so no big deal there. I'd love to have a spot to make all pretty like yours. Love the "ugly bird" he gives a lot of whimsy and character to your vignette. Great vignette. Kim, I can't believe you haven't changed this vignette since December. LOL. I love the bottles and the ugly bird picture. Glass bottles make such an easy and very pretty vignette! Love its simplicity. Very pretty Kim!! Love the black shade on that lamp...love the shape of it too! I love the soft color of the bottles against the color of the chest. You had me at beach glass lol. That is a lovely spot and the chest is a really great piece. Love the space, and love your bottles. Love the chest and the bottles.......I wouldn't want that ugly bird to greet me when I came in the door!!! Oh my gosh Kim! I got my good laugh this morning hearing you call that picture the "ugly bird picture". Yes, he is not the most handsome... but doesn't that make him unique and fun! I love the bottles and the lamp. My husband collects those too. Love the colors. Love those vintage bottles! Yay so happy that it's available on Android!!! That is wonderful news! How can I stop the pop up ads from covering up the pictures on your lovely feed? So distracting!! Sorry about those, but they are a necessary evil. You should be able to click on the x or down arrow in the upper right corner of an ad and it will go down. Such a welcome site even more for the mudroom! I have to check out that app! Your collection of bottles makes me green with envy. And I love your "ugly" bird!